You are here: Home / 2. Cargo Control / What Makes Cargo Nets So Strong? Keep cargo secure, protect your drivers, and get to the destination safely. Sounds easy enough, but many things can go wrong between Point A and Point B. While you can’t always prevent accidents or injuries, you can minimize the chances of either happening. Investing in cargo restraint products like Bednet® Cargo Control Solutions for your company trucks and SUVs is one of the best ways to do so. One of the best features of our Bednet® products is the strength of the seatbelt webbing used in their construction. This seatbelt webbing is what makes our cargo nets strong enough to keep heavy loads of all sizes secure. Regardless of what you’re transporting, safe and practical solutions – like cargo nets – protect your inventory and drivers. In addition, these solutions can save money for your company in the long run. Why a Bednet® from Adrian’s Safety Solutions? We offer a range of products made from super-strong seatbelt webbing to suit your specific fleet safety needs. Our Bednet® cargo restraints can easily accommodate different types of vehicles and space constrictions. The Bednet® Original Cargo Restraint System, for example, is perfect for quick adjustment and even semi-permanent installation for pickup trucks. 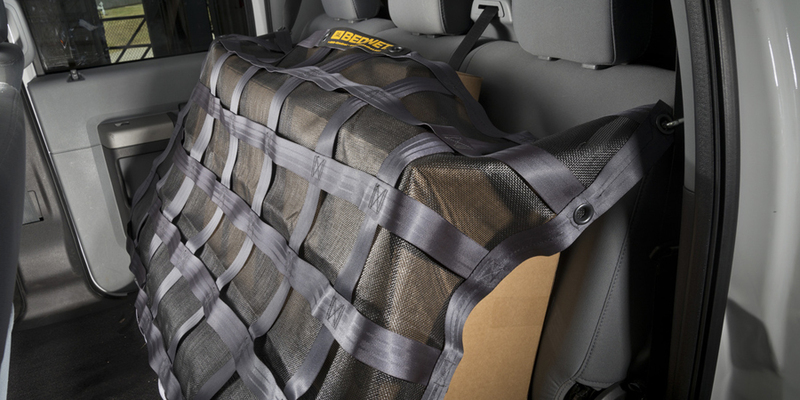 The Bednet® Interior Cargo Restraint with Mesh keeps loose cargo safety stowed in the back seat of your truck or SUV so you can concentrate on driving. And the Bednet® Original Mini secures loads in UTVs, SUVs, and service carts using four integrated adjustable straps. At Adrian’s, we lead the industry in quality and engineering for transportation, warehouse pallet racking, and freight safety solutions. Our knowledgeable and experienced team can help you understand why cargo nets are an efficient, affordable way to protect your inventory, drivers, and business. View our products to learn more about our other safety solutions.